Students who are working to become efficient with fractions must learn to seek out “friendly” numbers — a shifting target depending on the problem’s denominators. Once they recognize multiplication/division relationships, students can exploit the properties of multiplication to simplify computation. The following string encourages them to do just that. The first problem in this string is easy enough to solve using the distributive property (see below). For the second problem, you might ask what would make this problem easier — drawing some attention to the fact that the first problem contained a helpful relationship between the 1/3 and the 3. If students search they will find a 3 in the second problem as well. 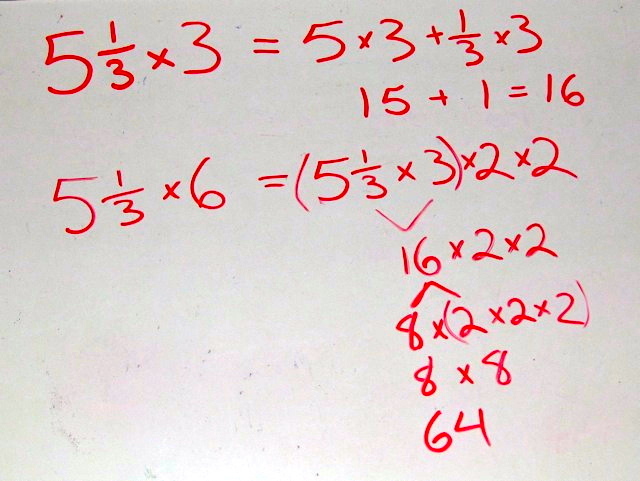 The third and fourth problems help reinforce the usefulness of the associative property to simplify problems. The fifth problem will be tricky unless students use the first as a helper, but then it becomes simple. 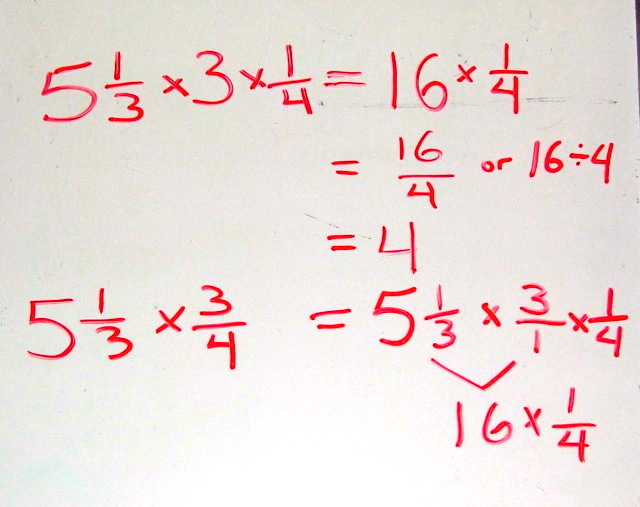 If students are stuck on the sixth problem, remind them how useful it has been to split problems into factors and expressions they already know. The last two problems do not provide helper examples, and this is intentional. 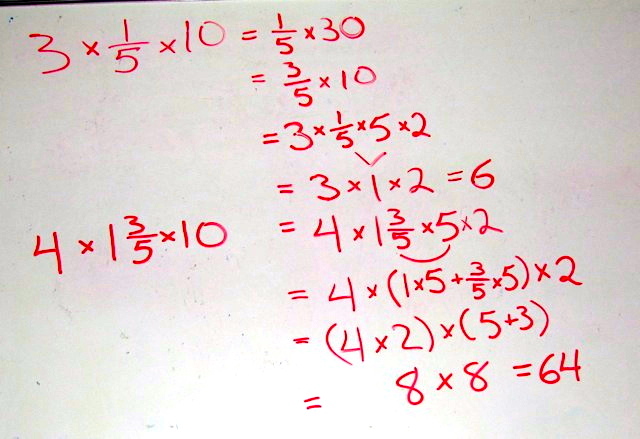 Students may recognize that looking for a 5 will help simplify the fifth problem, or they may calculate it differently. It’s worth exploring why looking for a 5 made this problem easier. Earlier we looked for a 3 to make the problem easier. What’s going on there? With the final problem, however, students must act strategically to solve it mentally. Designed as part of a geometry unit that includes volume calculations, this string encourages students to find efficient strategies to solve both two- and three-factor multiplication problems. 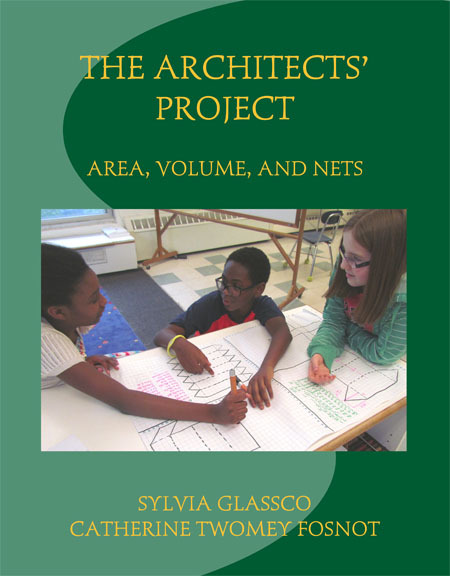 The Architects’ Project, by Sylvia Glassco and Catherine Twomey Fosnot, is aligned with Contexts for Learning Mathematics and the 6th grade CCSS-M standards for area, volume, and nets. Do you use array model for this string? If so, what does 5 1/3 x 3 x 1/4 look like? Where is the answer? Just 1/4 of the whole which is 4? 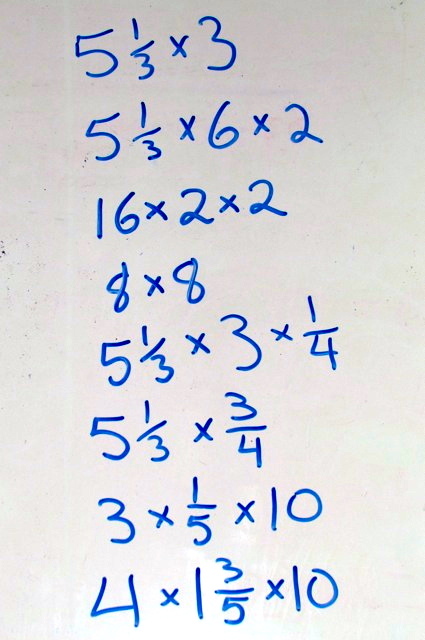 is the context for 5 1/3 x 3 x 1/4 the same for 5 1/3 x 3/4? “A wall is 5 1/3 sq feet. if one can of paint covers the whole wall, how much does 3/4 can of paint cover? Or how much does 3 one fourth cans of paint covers?